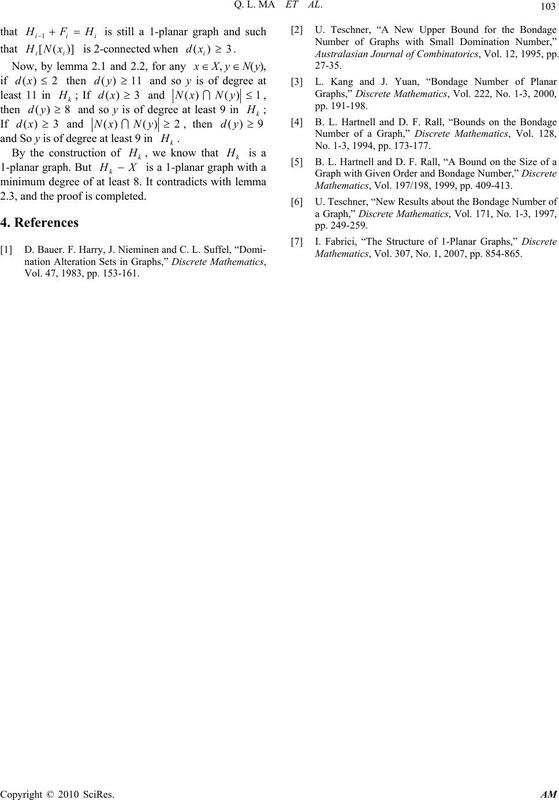 we prove that 12)( Gb for a 1-planar graph G.
and the maximum degree by )(G. 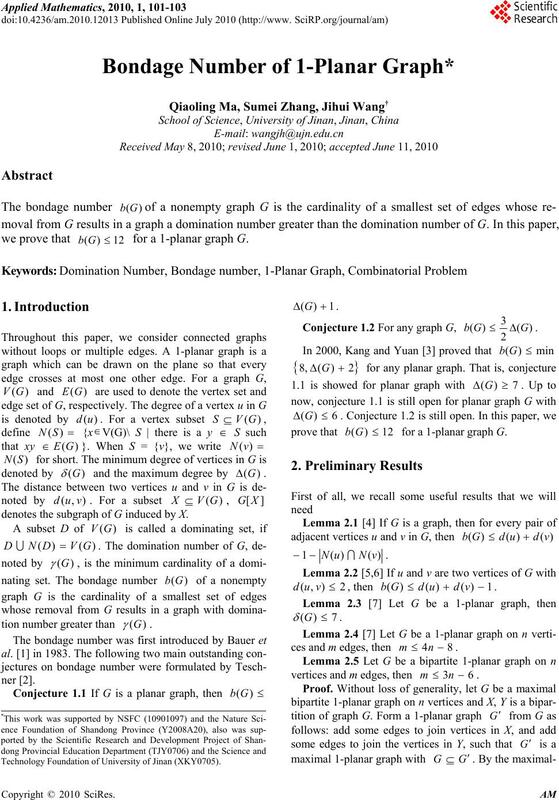 denotes the subgraph of G induced by X.
Gb for a 1-planar graph G.
vertices and m edges, then 63 nm . Technology Foundation of University of Jinan (XKY0705). Q. L. MA ET AL. 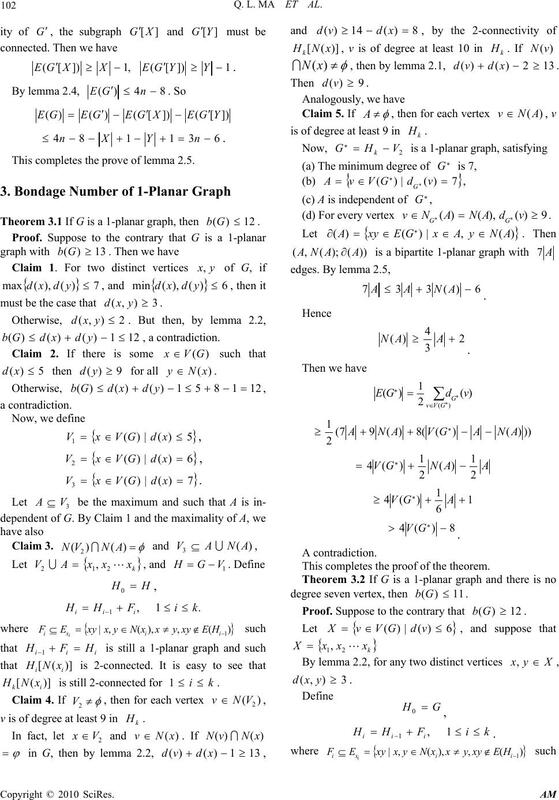 This completes the prove of lemma 2.5.
must be the case that 3),( yxd. 121)()()(  ydxdGb , a contradiction. 5)( xd then 9)( yd for all )(xNy . )]([ ikxNH is still 2-connected for ki1. degree seven vertex, then 11)( Gb. Proof. Suppose to the contrary that 12)( Gb . 2.3, and the proof is completed. Vol. 47, 1983, pp. 153-161. Australasian Journal of Combinatorics, Vol. 12, 1995, pp. No. 1-3, 1994, pp. 173-177. Mathematics, Vol. 197/198, 1999, pp. 409-413. Mathematics, Vol. 307, No. 1, 2007, pp. 854-865.